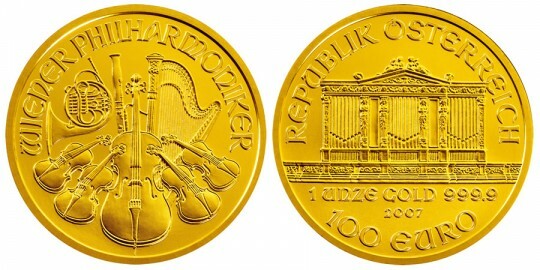 The Austrian Vienna Philharmonic Gold Bullion Coin was first launched in 1989 by the Austrian Mint. Through the test of time it has proven be extremely popular and, according to the World Gold Council, one of the best selling investment coins in the world. Honoring the Vienna Philharmonic Orchestra -- a world leading orchestra, the coin is struck in four differing sizes, and is composed of 24-karat, 99.99% pure gold. From 1989 through to the end of 2001, each coin was denominated in Austrian Shillings. In 2002, it became the world's first gold bullion coin with face values in Euros -- either 100, 50, 25, or 10 for one ounce, one-half ounce, one-forth ounce, and one-tenth ounce sizes, respectively. 2004 was a special year for the series, as the Austrian Mint struck fifteen 100,000 Euro denominated versions where each had a massive 31,103 kg weight and a pizza-sized diameter of 370 mm. As is standard with precious metal coinage, their face value has no relevance to the actual value. Their bullion content is always worth more, minimally. The denomination is simply for symbolic or identification purposes. Interestingly, the gold Philharmonic coin is the first to have its image shown on the side of an airplane (Austrian Airlines Airbus A380). Beginning in 2008, the coin's popularity was also instrumental in bringing about the production of nearly identical Silver Philharmonic coins. The reverse side of the coin features a harmonious design of musical instruments representing the world famous Vienna Philharmonic. Additionally, at top are the inscriptions "WIENER PHILHARMORIKER" for "Vienna Philharmonic."